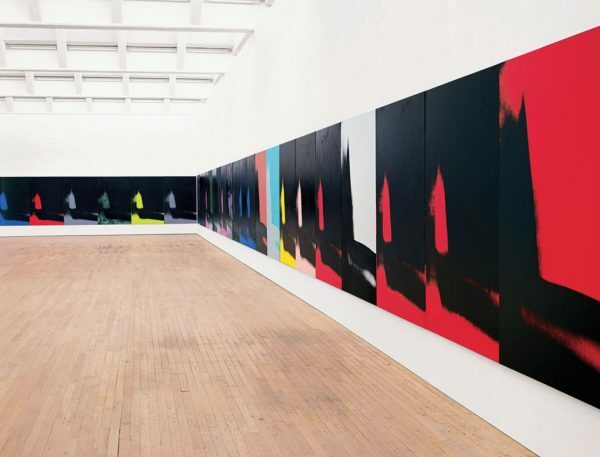 Warhol’s newly restored 102-canvas work Shadows goes on show in New York. The artists turning famous photographs into elaborate dioramas. Artist Mickalene Thomas on how photography became the center of her practice. Alex Katz takes art lovers on a stroll through art history with his new book. Ben Eine elevates typography artworks for his London exhibition at StolenSpace. Picasso and the muse that was his modern day Mona Lisa. Mr. Brainwash is back in New York with a new show. Anish Kapoor’s copyright infringement lawsuit against the NRA heads south to their home turf. Artist accuses Florida officials of censoring his photographs of queer life. Art Doc ‘The Price of Everything’ is so hypnotized by price that it neglects to say much of value about value. Unauthorized ‘Art of Banksy’ exhibition coming to Miami for Art Basel 2018. Natascha Süder Happelmann will represent Germany at the 2019 Venice Biennale. Bangkok’s inventive new biennial brings contemporary art to Buddhist temples. One of China’s most expensive artists Zeng Fanzhi gets a global rebrand. Harold Stevenson, freethinking artist, gallivanter, and painter of ‘The New Adam,’ dies at 89. Yoko Ott, Executive Director of Portland’s Yale Union, dies at 48. With an assist from Google, the Met will make more than 406,000 digital images of art publicly available. The vicarious warmth of Amy Sillman’s paintings currently on view at Camden Arts Centre, London. Jeremy Deller says studios are ‘a lifeline’ for artists as Studio Voltaire announces £2.3 million expansion. ‘Collaborating Is Evidence of Being Human’: Virgil Abloh and Takashi Murakami join forces for Gagosian show. Yayoi Kusama and Takashi Murakami challenge counterfeit exhibitions of their art in China. Van Gogh shows planned for Houston, London, Amsterdam and Den Bosch in 2019. Petah Coyne goes deeper into darkness at Galerie Lelong in New York. Jim Dine breaks out: The New York art world has never been kind to him. Frieze announces partnership with Manhatten museum The Drawing Center. Here’s the exhibitor list for the inaugural edition of Felix LA art fair. Ai Weiwei takes over Los Angeles with 3 new shows. Jim Carrey’s ‘piercing scream’: A blisteringly political art show offers a window to his soul. PODCAST: Curating with Cecilia Alemani and Ingrid Schaffner. What I’ve learned in the year since I uprooted my gallery. Mary Iverson’s new landscape paintings go under the knife. Ana Mendieta Estate and Amazon Studios reach a settlement on ‘Suspiria’ copyright infringement suit. Giorgio de Chirico copied his most popular works to mess with his collectors. Bernar Venet’s retrospective creates a modernist mausoleum. Sara Morawetz walks from Dunkirk to Barcelona to measure the curvature of the earth. How the massive artworks at music festivals are created. Russia announces major Kandinsky show in Saudi Arabia amid Khashoggi murder controversy. Can art cure you? Doctors to prescribe museum visits in pioneering treatment. Artemisia Gentileschi’s market gains steam as collectors catch up with art historians. Christie’s sells first artwork created entirely by artificial intelligence for 40 times initial estimate. With largest-ever allotment for Department of Cultural Affairs, NYC grants $43.9 million to arts programs. Roy Lichtenstein Foundation gives $5 million to The Smithsonian Institution’s Archives of American Art. Worcester Art Museum receives $600,000 grant from Barr and the Klarman Family Foundation. These famous artists proved that staying up late can lead to great ideas. Diego Marcon wins 2018 MAXXI Bulgari Prize. A crash course in basic papermaking. Categories: Contemporary Art, Features, Overtime, Street & Urban Art. Tags: Andy Warhol, Features, Overtime. Contemporary Art, Street & Urban Art.